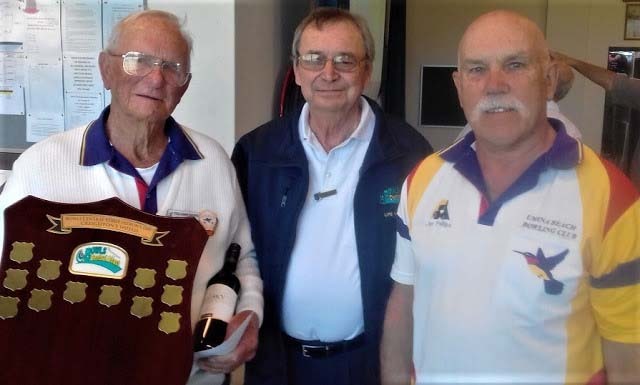 The Patron's Graded Pairs Final was successfully concluded today (17th September) at the Greens the Entrance, The overall winners were Umina Beach's Fred Hawksworth and Jim Phillips. On hand to congratulate Fred and Jim was BCC Patron John Peek who first suggested that we hold a Patrons event. BCC is enormously grateful to Creightons for their sponsorship of the Day. The winners will hold at their Club for the next 12 months the new Creighton's Shield to commemorate their win. They also received $400 prize money and a bottle of wine each donated by the Patron. Other winners were Mingara's Barry Pike and Peter Yates who were 2nd receiving $300, Wyong's Robert Burns and Alan Carpenter were 3rd receiving $200, and Umina Beach's Peter Springett and Damien McPherson 4th receiving $100. The Entrance's Jason Scott and Graham Horton received $50 for the best card in Round 1. Similarly Mingara's Brian Millanta and Neil Dell for Round 2 and Halekulni's Gary Graham and Fred Peters for Round 3. All the prize winners were generously given a bottle of wine donated by the Patron. The Greens The Entrance hosted the day superbly. The Greens were very fast and a pleasure to play on. Our thanks to Miro Perovic and the other Club staff and the BBQers led by Tony Morley.